Trouble with the Curve is classic Clint Eastwood. Although the film is directed by Robert Lorenz in his debut effort, Eastwood’s influence permeates the film as Lorenz was his first assistant director in Million Dollar Baby, Mystic River and Space Cowboys, and he was second assistant director for Eastwood in Bridges of Madison County and Absolute Power. The result of this mentorship is obvious as we once again see a sensitive portrayal of a strong but troubled man who is simply trying to find his way. Although life often throws us a curve, there are those who cannot handle it. In this tale written by Randy Brown, the curve comes in both figurative and literal forms. 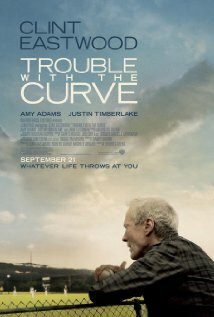 The figurative curve occurs when Gus (Clint Eastwood) and Mickey (Amy Adams) lose the person holding their lives together, Joanna, who was Gus’ wife and Mickey’s mother. Though her death occurred 27 years earlier when Mickey was only six years old, Gus continues to struggle with handling not only the loss of his wife but also the parenting responsibility for his daughter. He had placed Mickey in the care of her aunt and uncle for a year. Unable to explain why he did this, Mickey experiences his action as rejection. It is a deep and unresolved sorrow around which the film revolves. The actual curve of a pitched baseball comes into play in the story when the curve can’t be hit by a promising young player named Bo Gentry (Joe Massingill). The number one pick of the nation, he is sought after by all the major league teams. Gus, as a highly celebrated and effective scout, has come to check out Bo for the team’s draft. Though he has signed many of the great players of the game, Gus is considered by some as an ancient dinosaur in a changing game relying more and more on technology rather than experience. Micky follows Gus to check up on him after hearing a doctor’s report on his failing sight. It is the most time they have spent together in many years, and neither wants the other one there. Bringing a healing and playful presence into the tension between Gus and Micky is a young scout on his first assignment, Johnny (Justin Timberlake). The predictable but believable romance that forms begins a healing process for everyone. Also assisting in this process is the life-long friend and supervisor of Gus, Pete Klein (John Goodman). As the director of scouting for the franchise, Klein both understands and cares about Gus, knowing well his unique skills as well as his accelerating weaknesses. As an easily understood parable of the complicated relationship between an inadequate father and hurting daughter both consumed with their work and impoverished by their isolation from one another, the film explores the complexity of their relationship while making us care about them. In the process of resolving the tensions of both the story and the realistic issues the film addresses, Trouble with the Curve draws us into the story and proves once again the power of the Eastwood genre. We hope that Lorenz will continue the legacy of this accomplished storyteller. 1. The loss of a wife and mother is devastating to a family. How would you have handled the care of Mickey if you had been Gus? 2. It is difficult to deal with the issues of aging and its physical losses as well as the changes in technology that can easily leave us behind. How are you dealing with your own aging process and the changes in technology in your own occupation? 3. It was difficult for Gus to express his grief and fear to his daughter even when she is a mature woman. Mickey spent years in therapy about their relationship - why do you think Gus did not? Posted on February 8, 2014 by Cinema In Focus and filed under 3 STARS, THOUGHT-PROVOKING and tagged 3 STARS THOUGHT-PROVOKING 2012 PG-13 RATED DRAMA SPORT.